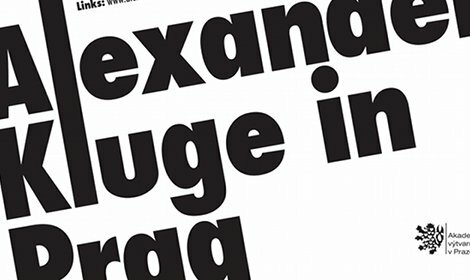 Alexander Kluge in Prague is a series of film screenings by the prominent writer, director and producer Alexander Kluge who celebrated his eightieth birthday this February. The Academy of Fine Arts Prague will introduce author’s film works in a three-days programme from the 17th to 19th May which will be in the Czech Republic screened for the very first time. The six series of the programme will introduce three full-length features: In Danger and Deep Distress, the Middleway Spells Certain Death (In Gefahr und größter Not bringt der Mittelweg den Tod), The Power of Emotion (Die Macht der Gefühle), Miscellaneous News (Vermischte Nachrichten); there will be also presented chapters from two monumental projects: News from Ideological Antiquity. Marx – Eisenstein – Das Kapital (Nachrichten aus der ideologischen Antike. Marx – Eisenstein – Das Kapital) and Fruit of Trust (Früchte des Vertrauens) and selection of short films. The programme was curated according to to the relevance to current issues of the contemporary society as the selected works address them more than ever before. 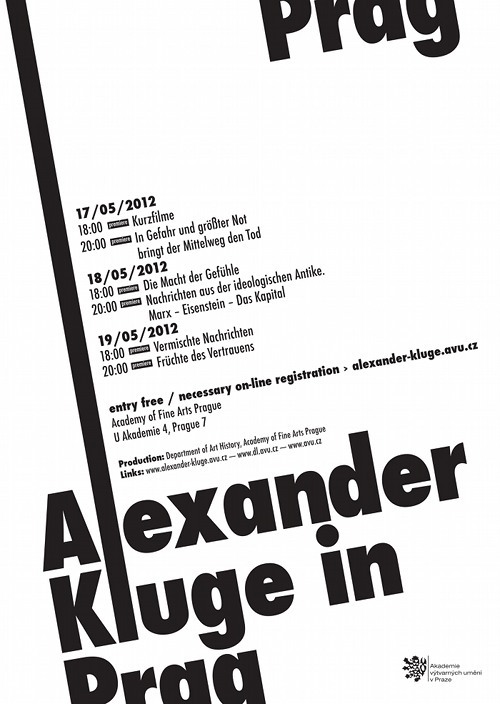 The entry for screenings is free, however on-line registration on the website of the project http://alexander-kluge.avu.cz is necessary and there you can find more information about the work of Alexander Kluge.